1. For which criteria in workflow "time dependent workflow action" cannot be created? 2. What is the advantage of using custom settings? Ans : You dont have to query in apex (fire select query) to retrieve the data stored in custom settings. 3. What are the different workflow actions available in workflows? 4. What is whoid and whatid in activities? Ans: standard controller inherits all the standard object properties, standard button functionalities can be directly used. Custom controller defines custom functionalities, a standard controller can be extended to develop custom functionalities using keyword "extenssions"
6. Can you have more than one extenssions associated with a single page? Ans : Yes we can have more than extenssions. 7. If page is having multiple extenssions and if two extenssions have methods of same name. Then which method out of these two will be called upon calling from vf page ? Ans: The one which is present in the controller defined on the left side will be called. 8. What are governer limits ? Ans: Governer limits are the limits imposed by salesforce so as to avoid monopoly by orgs in using salesforce shared resources. 9. how can we implement pagination in visualforce ? Ans: use standardset controllers for implementing pagination. 12. What happens upon lead conversion ? Ans: When lead is converted a contact, account and optionally an opportunity is created. 13. What are different ways of deployment in salesforce ? 14. How can you override a list button with a visuaflorce page? Ans: Visualforce page should be a list controller that is it should have "recordsetVar" attribute defined in page tag. 15. Is it possible to bypass Grant Access Using Hierarchies in case of standard objects ? Ans : No. This is default and cannot be changed. No.13 .... and the lead becomes read only. Plz provide more triggers for beginners. Thanks for sharing such a great information..Its really nice and informative. If you are looking for Oracle is one of the parts of Oracle Fusion offers a versatile of the art reporting platform and we are provide materials. 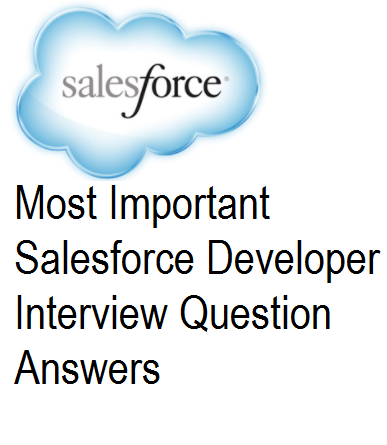 This blog explains the details of most popular salesforce interview questions and answers. This helps to learn about what are all the different method is there. And the working methods all of that are explained here. Informative blog.For more details about oracle fusion financial please check our website. Thanks for sharing useful interview questions with us,It will helpful to so many users like me. Usually, I never comment on blogs but your article is so convincing that I never stop myself from saying something about it. You’re doing a great job Man. Thank you for Sharing great list of Salesforce interview questions. i am searching the Job in salesforce developer.